When you start learning German, one of the very first things you will probably learn is how to introduce yourself in German. There are several reasons why this topic is important. First, every time you meet new people in a German-speaking country, you are going to introduce yourself in German. You will repeat the same phrases in German so many times, that it makes sense to learn them by heart at the very beginning of your language-learning journey. Second, the self-introduction phrases are relatively easy to learn even if you are a total beginner. Being able to talk about yourself in a new language so quickly gives you an immediate boost in confidence and motivates you to learn more. So don’t hesitate and learn how to introduce yourself in German. 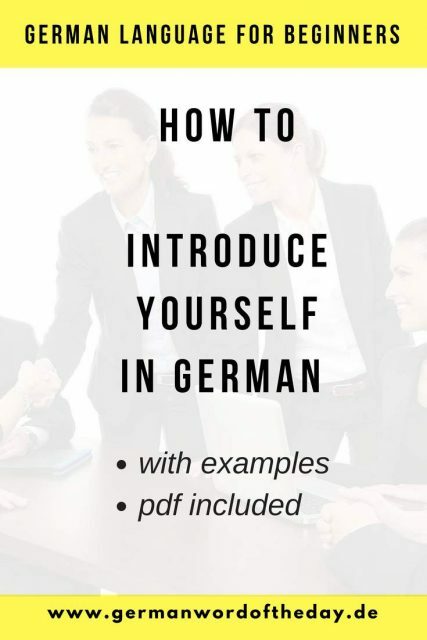 My tip for you: Download and print “How to introduce yourself in German PDF”, fill it with the information about yourself and learn it by heart as a script. If you don’t know how to say some words like your country, profession or hobby in German, use any available online dictionary to translate. 1. How to say “My name is ….” in German. Ich heiße _______ . – My name is (name) (literally means ‘I am called….’). Ich bin _______ . – I am (name). Mein Name ist _______ . – My name is (name, surname) . Ich heiße Maria. – My name is Maria. Ich bin David. – I am David. Mein Name ist Lucy Stein. – My name is Lucy Stein. First two options are less formal. “Mein Name ist …” is more often used when you say your full name. 2. Country and nationality in German. Ich komme aus _______ . – I am from (country). Ich komme aus Deutschland. – I am from Germany. Ich komme aus Indien. – I am from India. Ich komme aus den USA. – I am from the USA. Ich komme aus der Ukraine. – I am from Ukraine. Most of countries in German language are used without articles, but there are some exceptions like die USA, die Ukraine, die Türkei etc. The preposition aus = from always takes the dative case, so if the country has an article, you have to change the article to dative case. I know it can be confusing for the beginners, so you can also just use Google your country name. Easy German has a great video about countries with articles. Ich bin _______ . – I am (nationality). Ich bin Mexikaner/Mexikanerin. – I am Mexican. Ich bin Amerikaner/Amerikanerin. – I am American. For most nationalities, the ending -in is added for the female form. Ich wohne in _______ . – I live in (city/country). Ich wohne in Berlin. – I live in Berlin. Ich wohne in Australien. – I live in Australia. Ich wohne in der Schweiz. – I live in Switzerland. Here the preposition in also takes Dative case, so you have to conjugate the article in dative if the country is used with the article. Ich bin _______ Jahre alt. – I am (age) years old. Ich bin _______. – I am (age). Mein Geburtstag ist im_______. – My birthday is in (month). Ich bin 26 (sechsundzwanzig) Jahre alt. – I’m 26 years old. Ich bin 55 (fünfundfünfzig). – I am 55. Mein Geburtstag ist im August. – My birthday is in August. Months in German are very similar to English, read more here. Ich bin _______ von Beruf. – literally means I’m ____ by profession. Ich bin _______ . – I’m (profession). Ich bin Student/Studentin. – I am a student. Ich bin Rentner/Rentnerin. – I am retired. Ich bin Lehrer/Lehrerin von Beruf. – I’m a teacher. Ich bin Programmierer/Programmiererin. – I’m a programmer. Ich bin Arzt/Ärztin. – I’m a doctor. Same as with nationalities, the words for professions in German are different for women and men. The ending -in indicates that the person is female. Meine Muttersprache ist _______. – My mother tongue is (language). Ich spreche _______. – I speak (language). Ich lerne _______. – I am learning (language). Meine Muttersprache ist Spanisch. – My mother tongue is Spanish. Ich spreche Englisch, Französisch und Arabisch. – I speak English, French and Arabic. Ich lerne Chinesisch und Deutsch. – I am learning Chinese and German. Ich bin _______. – I’m (marital status). Ich bin ledig/verheiratet. – I’m single/married. Ich habe ein Kind/zwei Kinder. – I have a child/two children. Ich habe keine Kinder. – I don’t have children. Ich habe 3(drei) Geschwister. – I have 3 siblings. Ich habe keine Geschwister. – I don’t have siblings. Ich habe einen Bruder/zwei Brüder. – I have a brother/two brothers. Ich habe eine Schwester/zwei Schwestern. – I have a sister/two sisters. Ich bin ledig und habe keine Kinder. – I’m single and dont have children. Ich bin verheiratet und habe 3 Kinder. – I’m married and have 3 children. Ich habe einen Bruder und zwei Schwester. – I have a brother and 2 sisters. Ich habe 3 Schwestern. – I have 3 sisters. Mein Hobby ist _______. – My hobby is (hobby). Meine Hobbys sind _______. – My hobbies are (hobbies). Mein Hobby ist Musik. – My hobby is music. Meine Hobbys sind singen und tanzen. – My hobbies are singing and dancing. Mein Hobby ist Einkaufen. – My hobby is shopping. 9. How to say “I like…/I don’t like…” in German. Ich _______ gerne. – I like (doing some activity). Ich _______ nicht gerne. – I don’t like (doing some activity). Ich reise gerne. – I like travelling. Ich koche nicht gerne. – I don’t like cooking. Ich lese gerne Bücher. – I like reading books. Ich esse gerne Gemüse. – I like to eat vegetables. Ich mag _______. – I like (something). Ich mag _______ nicht. – I don’t like (something). Ich mag Sushi. – I like sushi. Ich mag Pizza nicht. – I don’t like pizza. Ich mag Kaffee, aber ich mag Tee nicht. – I like coffee but I don’t like tea. Mein Lieblings… ist _______. – My favourite (food/movie/sport) is (name). Mein Lieblingsessen ist Pizza. – My favorite food is Pizza. Mein Lieblingssport ist Fußball. – My favorite sport is football. You can add Lieblings- (favorite) to any word to talk about your favorite things: Lieblingsschauspieler(favorite actor), Lieblingsbuch(favorite book), Lieblingsfilm(favorite movie), Lieblingsgetränk(favorite drink). Now introduce yourself in German in the comments below!